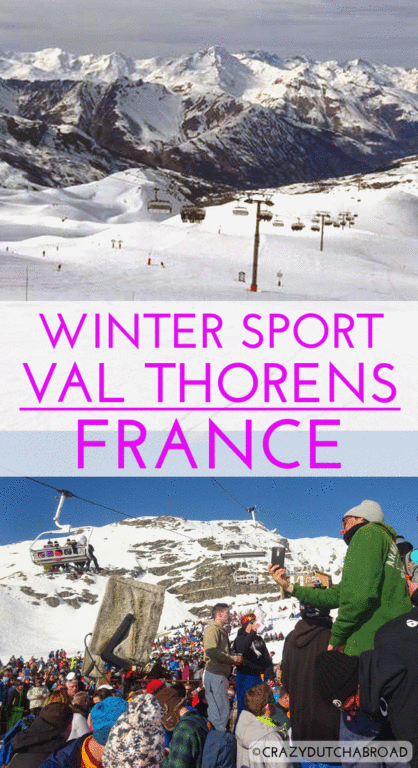 Winter sport Val Thorens - Les 3 Vallees, Savoie, France! Val Thorens in the Savoie is one of the biggest ski areas in the world with over 600 km of connected slopes. This was my first winter sport in France and I was blown away by the scale of this area, Les 3 Vallees. Val Thorens, Les Menuires, ​Méribel and ​Courchevel are the ski areas and it can take a full day to go from Val Thorens to Courchevel and return. Even the map was quite a challenge at the beginning and you really need to time your return because a taxi back costs a fortune since it has to make a huge d-tour. The amount of ski lifts is crazy, they even go straight through town, you can just go anywhere. Val Thorens offers 600 km of slopes, the biggest ski area in Europe and one of the biggest in the world. This ski village already lays at 2300 m - the highest in Europe. The slopes are almost all above 2000 m height. There are two huge clubbing-style apres-ski bars on the slopes: La Folie Douce and 360 Bar (both close at 5 PM). After dark it continues in party clubs in town (change clothes before you go). The slopes are wide and a lot of the slopes are above the tree limit. Between two slopes you can easily go off-piste without even realizing it, everything is flat and fresh. Skiing is awesome here! The opportunity to ski from one valley to the other is great but you need to take some flat paths in between (I still hate them as a snowboarder). What really surprised me was the pick-nick vibe on the slopes. French people are known for bringing packed lunch and the same thing happens on the slopes, in an impressive amount. People just sit down on the mountain or in special designed areas and enjoy their packed lunch. If you check prices for food and drinks in the restaurants you will know why, it is horribly expensive! On the slopes it is always more expensive to buy food & drinks, but compared to restaurants on the slopes in Italy and Austria the prices are at least 25% higher! The fun part of enjoying typical food from the Alps or just a drink during the day was a bit off. Luckily there are some cheaper food stalls in the bigger commercial areas. Val Thorens known for having the best apres-ski in France. After experiencing apres-ski in different areas in countries this was a totally new experience. On the slopes there are two major apres-ski bars with house music, La Folie Douce and 360 Bar. At around 2 PM the party starts and all the chairs and tables go aside. If you have reserved a VIP spot your table is ready and you can start ordering fancy bottles of champagne. The DJ starts pumping-up the music and people start dancing while the guards take care of the queuing and crowd control. The slope next to La Folie Douce is filled with people sitting and enjoying themselves, like a typical festival area. Really cool, but the party stops at 5 PM! It is hilarious to watch the drunk people try to ski down, no wonder they close early. Once in town, there is no party going on until like 9 PM when people enter one of the bars (more like clubs) and there are no more outside drinks aloud. Apres ski parties on the slopes in Val Thorens! The town has a lot of not so charming purpose-built ski resorts where you can ski-in and ski-out. Way less romantic than the lovely chalets around Austria and Italy - unless you are a big spender. Big groups of young students are more common than exception and that is how the buildings are designed and maintained. You will find everything you need for your skiing holiday but everything comes with a price. My recommendations is to bring as much as possible from home or buy it before you hit the mountains, in a big Carrefour supermarket in Chambery for example. If you want to spend some money: The French cuisine is good! Especially after traveling in Asia for a year I tried to eat as much cheese as possible and this is not difficult. Cheese fondue and raclette are offered all over town. The raclette is a great experience. They put a huge piece of cheese on a frame with a heating element, the cheese melts on a plate ready to put over your potatoes or vegetables - yummy! French raclette & cheese fondue! Face West cafe and restaurant, a great place to watch the slopes and have lunch or drinks after skiing. After a day of skiing it is nice to have some good food. Val Thorens town is isolated since it is high up the mountains. This results in full and expensive restaurants and the service can be slow and unfriendly (on the slopes as well). Make sure to reserve a table beforehand or dine really late - like the French! Once you found a table and you are willing to pay the price you will find out most of the portions are huge. This did not match the fact that many restaurants do not allow you to take away food, no doggy bags. We ate at a restaurant where you could not share a meal and more than half had to be thrown away untouched. What a shame! Just be tactic when ordering. Les Temples du Soleil Val Thorens with 300+ rooms, your own ski locker and stunning views over the slopes! Backpacking in the Alps! The tour explained!